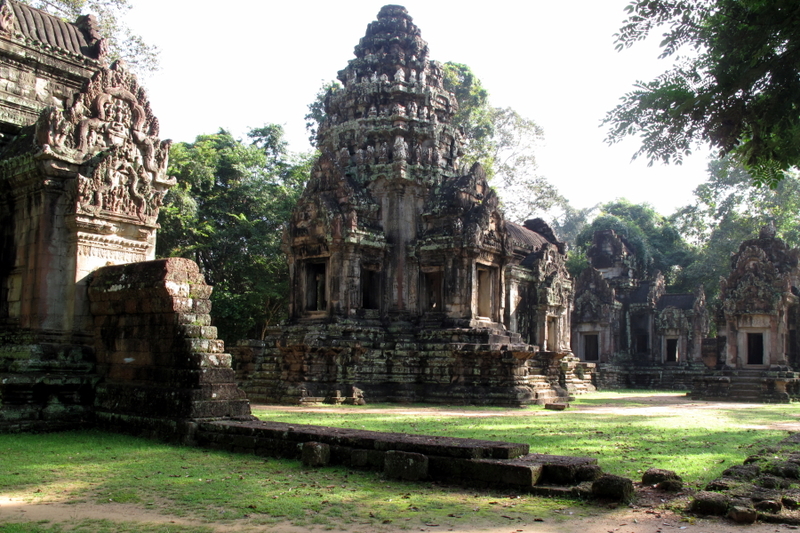 The Thommanon is a small temple just a short distance outside the eastern "Victory" gate to Angkor Thom. It is one of a pair of temples more or less identical in plan on opposite sides of the road. The temple on the south of the road is Chau Say Tevoda, which although more 'complete' in plan, is much more deteriorated. Although the Thommanon was once enclosed in a boundary wall, only the foundations of it remains. The buildings that do remain are all in a line, save for a lone library on the south side of the main east-west axis. The first structure on the eastern side is a large entry gate (gopura). Immediately behind this is a large hall, followed by the central sanctuary. These structures are more or less connected. Separate from them is the western gopura. What makes the Thommanon worth a stop are the intricate carvings found both inside and out on the central sanctuary. There are finely carved lintels over each of the doorways, as well as on the inner, false doors of the sanctuary, as well as on the exterior of the sanctuary.